It’s not simple company profile; it’s a unique family legend of best quality in right time with professional services. About ninety years ago, Mr. Khamu Mal started the business from a small village of Sindh, named Thano Bola Khan. He was selling best quality grains to his neighbors. His honesty and in-time professional services were appreciated by his customers. Soon his son, Mr. Veero Mal, joined him and slowly they started supplying grains to the neighboring towns and villages. By 1960, business was spreading all over Sindh. Their commitment to best quality in right time with professional services was highly appreciated by wholesale business dealers all over the province and their clientele started increasing quickly. During the 1970’s the Sole Proprietorship business was based on commitment to the customers but yet Mr. Veero Mal believed in the legacy of corporation where he opened his first titled office as ‘Jhoole Lal Corporation’. In 1984, ‘Jhoole Lal’ Corporation was converted to the name of Mr. Veero Mal’s third son Ramesh Kumar as R.K. Commission Shop(till today working) where Mr. Veero Mal was joined by his eldest son Mr. Gopal Khamuani as the new proprietor of the firm. Like his elders, Mr. Khamuani was also very committed and determined to turn family’s tradition of supply best quality into a legend. After the death of his father in 1992, Mr. Khamuani, motivated and trained his quite young brothers, Mr. Dev Das Khamuani and Mr. Ramesh Kumar Khamuani to join the business and continue family’s value orientation to the business. In the year 1998, Mr. Khamuani with his global interest to business gradually started exporting spices, pulses and grains into certain countries. This successful growth of business demanded the involvement of family’s fourth generation. In the year of 2000, Kanwal Trading was founded in the name of eldest grandchild of Mr. Veero Mal. Kanwal is the name of Mr. Gopal Khamuani’s first child daughter which means Lotus flower. Family does believe that the name actually reflects the nature of their clean and pure business. Together, their professionalism and commitment to deliver the best quality products pleasured them good fortune and within less time they became one of the major suppliers of various grains, rice, sesame seeds, spices and pulses in market. In 2005, after the graduation Mr. Chander Pal Khamuani and Mr. Om Parkash Khamuani also joined the legendary business along with his elder brother Mr.Gopal Khamuani. Skills and knowledge brought them ideas of expanding their business to other countries and open their first overseas branch office in Singapore on October 2012 which is now been looked after by Mr. Gopal Khamuani’s eldest son Mr. Rakesh Pal Khamuani together with the guidance of his father and uncle. Since 90’s the leaders of the company are exporting in bulk to the international markets without compromising the quality. We always pride to deliver in right time, where we have our own processing units of Rice, Sesame seeds and Pulses as well as huge storage capacity. 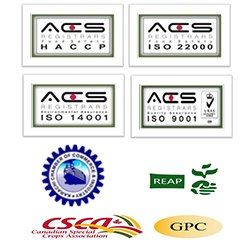 We are certified by ISO 9001:2008 QMS, ISO 22000:2005 FSMS and HACCP-2003. Our talented and experienced directors / employees have excellent customer relations with different countries like India, China, Srilanka, UAE, Africa and Far East. The legendary tale is long, but it’s the true reflection of the old-styled, value-oriented business. It’s an old business formula who’s young and energetic legends are as committed to the delivery of best quality in right time with professional services as their grandfather was a century ago.